Generate secure, intuitive HTML reports built with the latest web technologies to simplify your review of patent documents. Internet access is not required to review. Pinpoint each claim element with missing or ambiguous antecedent basis. Identify mismatched plural and singular forms. Identify inconsistently numbered terms in patent specification and patent drawings. Automatically fill-out numerous USPTO forms (including IDS forms) with the bibliographic information from the USPTO/EPO and stored practitioner/firm information. Analyze rejections and objections within any Office Action. Instantly download and review cited prior art. Generate Word shells and reporting emails using pre-defined templates and Office Action analysis. Quickly identify claim structure and variety of other useful information associated with the claims. 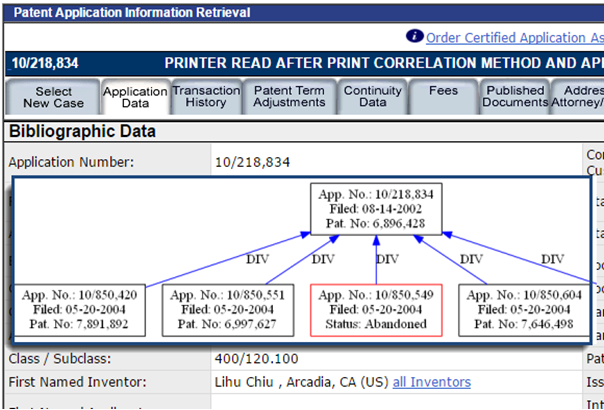 Generate patent family trees from PAIR's continuity data. Batch download documents from Private/Public PAIR. Download PDF, HTML, or text versions of US and foreign patents. 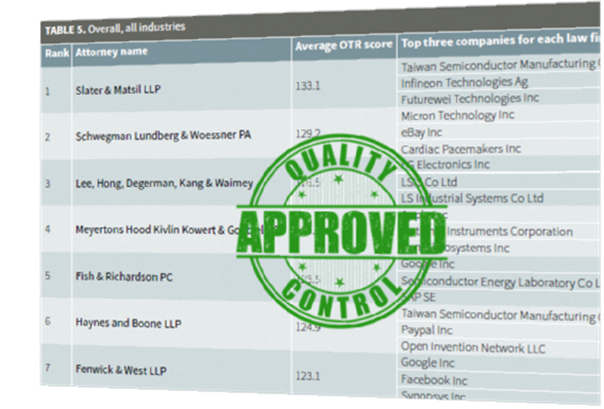 ClaimMaster is used in 8 out of 10 law firms ranked for the highest patent quality by Ocean Tomo and the Intellectual Asset Management magazine. Click here to read the study. "ClaimMaster has proven to be a very valuable tool and now I use it regularly. It is very helpful in detecting errors in patent claims, such as missing antecedents." "ClaimMaster is a quick and easy tool for ensuring patent claims are free of errors as well as aiding in many other patent drafting and prosecution tasks." "ClaimMaster provides you with an extra eye for detail at the touch of a button. What was once a final time-consuming review for claim errors, claim term support and reference numeral checks now takes only minutes. I use ClaimMaster every time I review a patent application"
"The ClaimMaster is a great resource for patent prosecution. I never file an application or amendment without first checking the claims with this software. It is also useful for other patent related tasks. You can tell it was written by a patent attorney!" ©2018 ClaimMaster Software LLC - Tools for Patent Proofreading and Patent Drafting.